At “Practices Making Community,” James K.A. Smith presents the Call to Action. Judson University James Didier Symposium on Christ and Architecture; September 15-16, 2016. 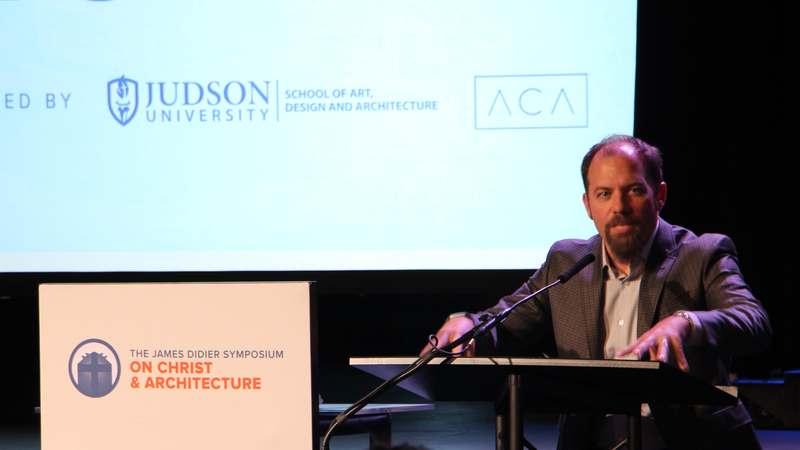 The Judson University Department of Architecture and the Association for Christians in Architecture will host the fifth annual James Didier Symposium On Christ & Architecture Sept. 15-16. • “Places of the Heart: How We Learn to Love” at 6 p.m. Thursday, Sept. 15. Calvin College professor of philosophy and author James K.A. Smith will address the Judson community, including architecture students and faculty, visiting architects, arts professionals, as well as place-based and home schooling educators. He will explain what you may know intuitively, that character is formed from what you learn to love. In choosing habits, more powerful than facts, you direct yourself to practices. These practices can be rooted in places and form community character. • “Century of the City: Theological Reflections on the Possibilities and Limitations of 21st Century Urbanism” at 7:15 p.m. Thursday, Sept. 15. Noah Toly is the associate professor of Urban Studies and Politics & International Relations and director of the Urban Studies Program at Wheaton College. He is also the senior fellow for Global Cities at the Chicago Council on Global Affairs and director of the Center for Urban Engagement. In 2011, he was named an “Emerging Leader” by the Chicago Council on Global Affairs, and for 2012-2013, he was appointed as a senior fellow at the University of Chicago’s Martin Marty Center for the Advanced Study of Religion. He is also a member of the steering committee for the Thriving Cities Project at the University of Virginia’s Institute for Advanced Studies in Culture. His research and teaching interests include urban and environmental politics and ethics.